The following information on current conditions on the north coast of West New Britain was sent by Steve Gallagher by e-mail to Naomi McPherson and Dorothy & David Counts in March and April 2001. Steve Gallagher works with the Summer Institute of Linguistics among the Bariai people, in the village of Bambak. He says about his residence in West New Britain, "My wife, Carol Jean, and I have been living in Bambak 4-6 months out of every year since 1993. We have two children, Erin (9) and Adam (6). He says, "We came to the field with SIL in 1992, the same year our daughter Erin was born.. We got our feet wet in the Madang area for a few months. Then it was time to choose where to go to begin a long term project. When we read the survey report on Bariai we fell in love with it. We first went out in April 1993 just to see the place and to let the people see us and to find out if they really wanted/needed a vernacular program. They gave us a very enthusiastic welcome, so in June that year, we took up residence in Bambak. The first three years we lived in a bush house. Our son Adam was born in 1994. We have now built a permanent house with an attached office where we do translation work. It's a good thing we built when we did. Now with the shipping service from Lae discontinued, there's no way we could ever bring in the building materials. We have a two-way radio similar to a ham except we only have license to use 3 frequencies which are shared by all our colleagues in PNG. They organize the radio time into 15 minute slots which have to be booked in advance. "We are assisting the Catholic church to translate the Scriptures into Bariai. In an effort to produce the highest quality work, we study all we can in the areas of anthropology and linguistics. In order to meet our organization's technical requirements we have written several unpublished papers over the years. One of our papers was published last year in one of our in-house publications called Data Papers on Papua New Guinea Languages." The Gallaghers' article is included in the bibliography section of this website. The conditions in West New Britain that Gallagher describes should be put in historical context, for much has changed since the Counts, McPherson, Goulden and Thurston did research there. Gloucester, or Cape Gloucester, was the administrative centre of West New Britain for many years. It was serviced by an airstrip that was built by the people during World War II and was still in service in 1985. For years the only government hospital in West New Britain was located there, as were the patrol post, the jail, police barracks, and the local government council offices. Today these services are located in Kimbe, the capital of the province. Until the 1970s the only "regular" shipping service for western West New Britain was from Lae (in Morobe province) and Rabaul (in East New Britain) to the Cape Gloucester/Kilenge region. It was the primary access point for anyone wanting to go to Kilenge, Bariai, Kaliai, and west Kove. There was no air strip (and very irregular ship service) at Iboki (now spelled Aiboki), a former plantation on the Vanu River. In 1985 the government was considering establishing an airstrip there but complicated land disputes put the project on hold. Steve Gallagher describes current conditions (2001) on the north coast of West New Britain as follows: The population of Bariai has grown to over 1400. That includes all the villages from Alaido (and its hamlets) to Siamatai, but not Malasongo. I guess this is due to better immunizations, but lately the health people from Gloucester have not been coming around, so there was a measles outbreak in Akonga last year. The aid post in Gurisi burned down, so now the only APO is at Bomai. It is interesting that the haus sik [health clinic or hospital] at Gloucester in cooperation with an Australian development agency built what is supposed to be a birthing center at the Bomai haus sik. Several Bariai women have been trained in midwifery, and the idea is for women to go to the birthing center for delivery by a midwife. I think the Aussies, having read Naomi McPherson's article on childbirth, thought they were following cultural ways when they set this thing up. However, it has never really gotten off the ground. The building stands, but it does not function in its intended purpose. The women still deliver on the beach, often without telling anyone they are in labor. There are no more expats in Gloucester. The Australian development agency went finish [left] in 1997. School is probably one of the few things that has improved over the years. Tok ples [vernacular] schools have sprung up in Bambak, Bomai, Kokopo and Gurisi. The first was at Bambak in 1995, and in 1996, another at Apising to serve both Kokopo and Gurisi. The idea at that time was to have west Bariai go to Bambak and east Bariai go to Apising. Akonga at first agreed to send their kids to Bambak, but then later started their own. In 1997 the villages from Bambak to Alaido broke off from Bomai and started their own community school, which rather quickly became approved by the province as an elementary school with a primary school for grades 3-8. Even though Akonga is now the only village sending their kids to Bomai, they also have recently been granted elementary status with permission to go up to grade 8. The same has been promised to Kokopo and Gurisi. The neat thing about all this is that the kids learn literacy in the vernacular first, and then they can transfer that skill to English in the higher grades. Studies have shown this to be a more effective way of education, and it seems to be working well in Bariai. With provincial approval, the vernacular teachers for prep and grades 1 and 2 are also on the payroll. Travel to and in the area is probably as difficult as ever. There is no longer an airstrip at Cape Gloucester. In 1998 a river overflowed its banks and dug a gorge through the middle of it. Currently the only airstrip is Aiboki in Kaliai. That's a good 3 or 4 hours by motor boat from Bambak (or 7-8 gallons of bensin [gasoline] for a one way trip, in good weather, that is). In bad weather, the time and fuel could be doubled. If you want to make a trip to Bariai you would probably fly to Hoskins on Air Niugini from Port Moresby, then (maybe after an overnight in a guesthouse) take an Airlink (small aircraft) flight to Aiboki. Airlink flies in there about two or three times a week. Fuel is usually more available in Kaliai since they have a timber company, and regular shipping service..
Because the price of bensin has skyrocketed to K15 per gallon, people generally don't go out trolling anymore. Also since 1999, regular shipping service from Lae to Gloucester has been discontinued for the foreseeable future. This has made it much more difficult to get trade store items and fuel. Also, there is no more market at Gloucester. There is a small government ship, the MV Arawe, which makes a bi-monthly run from Kimbe to Gloucester. Some local trade store managers bung (join) with those at Gloucester and charter a ship from Lae to Gloucester. You can imagine how expensive that is. Rice is now K2.50 per packet. People who used to go to Kimbe on the Express now either wait for the MV Arawe, or scrape the funds together to go to Garu by mon, (motorized dugout canoe) and catch a PMV to town. People still get money by selling copra. They bring it all the way to Kimbe themselves. Also, Taiwanese entrepreneurs come around every once in a while buying bags of dried sea cucumbers from the people. They can get fairly good money for this. The European Union has helped a clan in Mareka start a portable saw mill project. This is one of the few business success stories. It's totally managed by Bariai people and it's been functioning successfully without corruption or embezzlement since 1996. They load the timber onto the MV Arawe when it comes around. They seem to be careful about how they do it and are not clear cutting. Their physical environment is as beautifully pristine as ever. In spite of all their problems and woes, I would say people are generally happy and coping well. I nogat pasin raskol [there are no gangs or trouble makers there]. As far as what to call the language, this has been a sticky issue. As it turns out, the name Kabana is actually a word the Amara-speaking people traditionally used to refer to poachers. For many people nowadays it's merely a name, but for some people, especially older people who know the history, it has a bad connotation. At a meeting held in 1994 which had representatives from all seven Bariai villages, the present orthography was discussed and approved. The name of the language was also discussed at this same meeting and after some debate, they decided that the language should be called Bariai. The Amara language seems to be in real danger of dying out. However, one important domain for its use is the pinnacle of Mt. Sakail. They say the spirit will get angry if Kabana/Bariai is spoken there. Incidentally, the approved alphabet of Bariai has 16 letters. The digraph <ng> is used for all occurrences of the eng phoneme, and <v> is not used (except in some proper names in order to avoid mispronunciation by outsiders). Steve Gallagher describes the photographs he sent as follows: The first one was taken in Bambak in 1993. From left to right is Patrick Sari (Akonga), Jon Angis (from Bambak, now deceased), and Geti. The second is the eastern two thirds of Kokopo taken from the chopper in October 2000. (The wharf in the western side of the village is still there, but doesn't show in this photo.) The section of houses in the upper left of the photo are somewhat new. I guess as the population has grown so has the village spread out. The third is a picture of the proud authors of the first Bariai story book with Carol Jean in April 1994. (We had held a one week course in creative writing and the books they are holding are the product of that effort.) 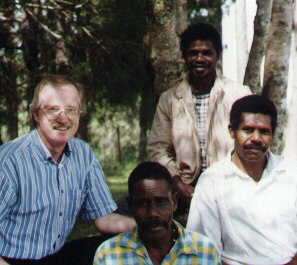 From left to right are Simon Pake (Bambak), Andrew Molage (Gurisi), kneeling is Theresa Sarom Boisen (Akonga), standing behind her is John Kuri (Mareka), next seated is Daniel, then Joe Bokoi (Gurisi), Joe Boisen (Akonga), and William Keloi (Kokopo). 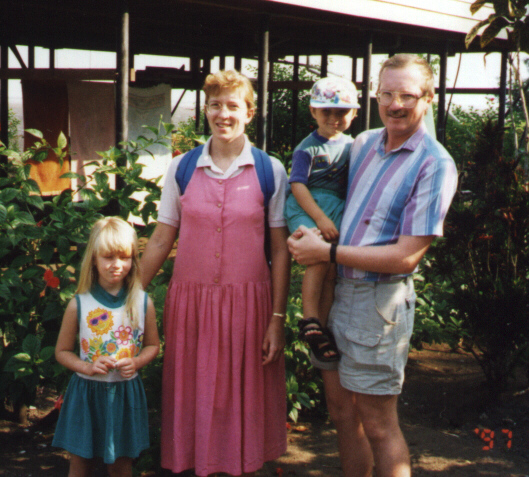 The next photo is the Bariai Bible translation team in April 2000. From left to right, me, lower center is Grevasius Mondo, upper center is John Kuri, and then Peter Biriu. John and Peter were probably teenagers when you (Naomi) were there. Mondo is older than the two of them, but he may have been serving as a catechist in Bakovi during your time. Our policy is to do only Bible translation and literacy, working with whatever church is already there. We're happy to work with the Catholics and they with us. Fr. Samuel (a national priest from Kilenge) came to the dedication of our Bariai Gospel of Mark in May 1998 at Bomai, and sprinkled holy water on the books. For the people, the priest's blessing is an important sign of authority and endorsement. The Aussie group who built the birthing center at Bomai was AIDAB. They were known in West New Britain as Kandrian-Gloucester Integrated Development Project. They did do some good things during their time including installing a water supply system in Akonga, and running several training courses in the production of cocoa. There is now a high school at Gloucester. It goes up through grade 10, and quite a few Bariai students have made it through. A handful have also gone on to provincial (grade 12) high school in Kimbe. There is still a fairly high drop out rate at all school levels. The high school fees are difficult for the average family to afford as you can imagine. The rate of bilingualism is very high. The vernacular is under no serious threat by Tok Pisin in spite of the bilingualism, since there are certain domains for the use of each language which seem to be quite stable.